A moment of panic set in for the handful of fans that arrived early for what was stated to be an 8pm start time. I had never seen the Bomb Factory that desolate. The few fans in attendance started to feel bad for Cope as they could hear every individual conversation bouncing off the walls in the vacant building. In the blink of an eye, all of that changed. By 8:30 you had to squeeze your way through the crowd to reach the bar and finding a decent spot to view the stage was a challenge. 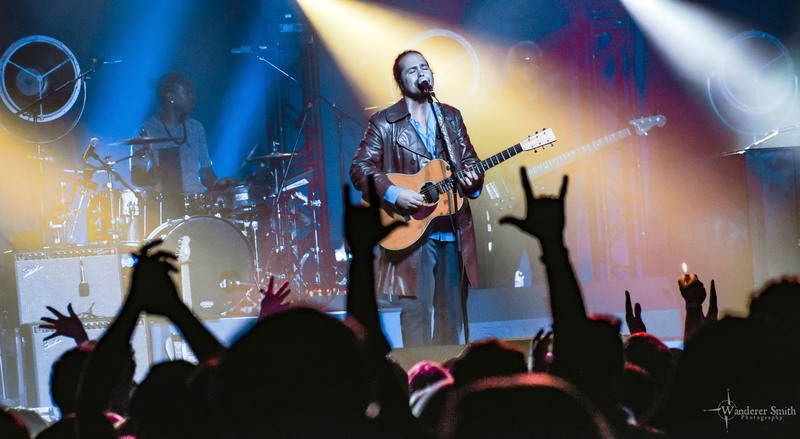 As plumes of smoke rose from the crowd high to the sky and the scent of peace and love filled the air, it all made sense – Citizen Cope and his fans do things at a different pace, on their own time. Citizen Cope @ The Bomb Factory, Dallas, TX. Photo by Corey Smith. Just after 8:45, the sounds of reggae beats from “Let the Drummer Kick” resonated from the PA as Cope walked out to screeching screams and a thunderous applause from what was now an almost full venue. Backed by a band of multi-instrumentalists, whose tones were some of the best I’ve heard in a long time, the crowd knew they were in for a memorable night. My only live Citizen Cope experience was an all acoustic set, so I was delighted to see the stage lined with classical pianos, synths, guitars, drums, and bass. Cope continued the set with “Duck Confit” and “Justice,” both from Heroin and Helicopters. The crowd had obviously done their homework on the new album and sang along to every word. Hips swayed as the floor turned into a dance hall much liked you’d see around a drum circle with nag champa burning long into the night. The set consisted of over 20 songs spanning most of Cope’s discography, with a majority of the songs coming off of The Clarence Greenwood Recordings. The sing-along’s didn’t stop as the set charged on with “D’Artagnan’s Theme” and “Son’s Gonna Rise.” Cope switched up the set-list from the rest of the tour and played “DFW” for the Dallas crowd. Vibrant red and purple lights bounced off of a peace-sign statue that sat on a table covered in a cloth tapestry, adding to the bohemian atmosphere. The mash-up of “Pablo Picasso” and “My Way Home” closed out the first part of the set before Cope returned to the stage for a 3 song encore. Cope changed the chorus lyrics of “Caribbean Skies” to ‘Texas Skies’ and had the crowd losing what was left of their voices. The night closed out with Cope leaving the stage to greet fans in the front during “Brother Lee” to show his appreciation. The Heroin and Helicopters Tour didn’t disappoint and I’m glad to see Citizen Cope continuing to bring peace and love to the World with his music.